iQsafety partnered with All Valve and Haws, who are the world’s leading manufacturer of Emergency Eye and Facewash Units. 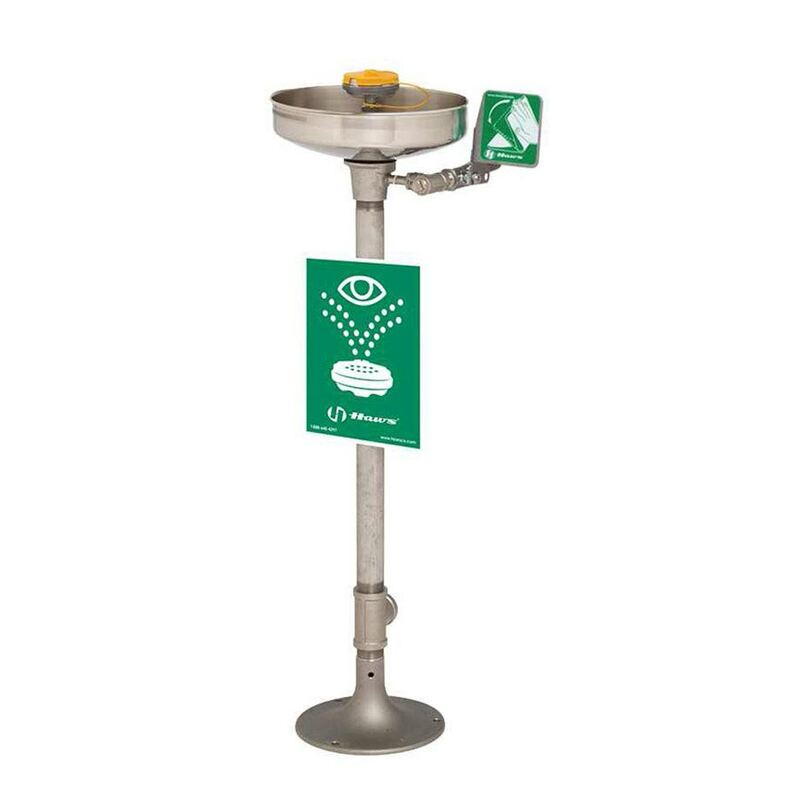 Whether you need a portable solution or plumbed into a continuous water supply, our range of Eyewash and Facewash units are the best in the market for treating the unfortunate effects of chemicals and dangerous goods caused to the face and eyes. The eyewash and facewash units in our range all meet the Australian Standard AS4775. Additionally, we exceed these standards with leading edge technology developed to enhance the safety features. Smooth laminar flows with inverted water streams deliver flushing to the eyes, which is the only system engineered that duplicates medical professionals’ recommendations. Our range includes a range of products to ensure that the right fit is available to your designated area. We can provide you with either a wall unit or mounted to the floor as well as a portable unit. If your areas have different inlet locations, then the perfect solution to the specific requirement. What type of Eyewash and Facewash do I need? It depends on the area in which chemicals, dangerous goods or dust are likely to come into contact with. The most important thing to consider is how quickly someone can get access to emergency help so you may need a combination of units. The other important consideration when selecting your Eyewash and Facewash unit is where there is a water inlet available so that you can choose the orientation that fits the area as it needs to. Are there Australian Standards for Eyewash and Facewash Units? Yes. The Australian Standard is AS 4775-2007 Emergency Eyewash and Shower Equipment and outlines the main considerations of a eyewash and facewash unit such as the flow rate requirements of the water, the material specifications and testing, which should be conducted weekly. What are safety features of an Eyewash unit? Our unique safety features included with the eyewash unit is a laminar flow with an inverted water stream. This means that when contact is made with the eyes and face, the pressure, water flow and water height will allow flushing at a rate that won’t cause further damage. Will your Eye and Facewash units treat my chemical emergency? Accidents with chemicals can be extremely damaging but our range of Eye and Facewash units act as the perfect first response to the situation while waiting for a trained medical professional to be able to treat the situation. At IQSafety, we’re proud to offer the highest quality eye & face wash units to businesses around the country. Wherever you’re based - including Melbourne, Sydney, Canberra, Brisbane, Darwin, Perth, Adelaide, Hobart and everywhere in-between - we’re confident we have the spill kits and absorbent products to ensure you’re prepared for any situation.